A deal to restore water supplies to Syria’s capital Damascus has collapsed after the killing of the lead negotiator and a renewal of a pro-Assad offensive. Hezbollah and regime forces have been attacking the Wadi Barada, 10 villages northwest of Damascus with between 50,000 and 100,000 people, since December 22. They have continued the assault despite a nominal ceasefire, brokered by Russia and Turkey, on December 29. President Assad has said the offensive will continue until “terrorists” leave the area. 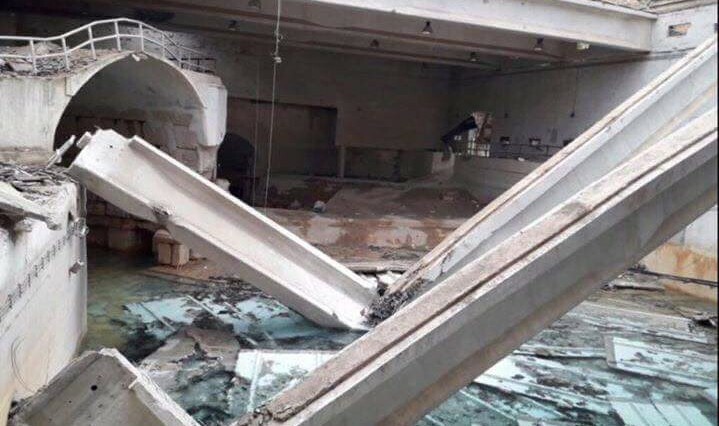 On Friday, a mutually-agreed negotiator, retired Syrian Army general Ahmad Ghadban, arranged a deal for an immediate ceasefire and access for engineers to repair the infrastructure for the al-Fija springs, damaged by regime airstrikes. The springs provide more than 60% of Damascus’s water, and their cut-off has limited supplies for more than 5 million people. Friday’s accord also set out terms for a rebel departure from Wadi Barada. However, Ghadban was shot to death on Saturday in contested circumstances. State media has said that “terrorists” assassinated him, but rebels and local activists say he was targeted by a Hezbollah sniper. Journalist Nour Samaha, citing “locals in the area”, offers a third version. She said Ghadban was shot and killed by a man from Wadi Barada, allegedly working for a Jordanian emir of the jihadists of Jabhat Fatah al-Sham. Her sources said the provincial Governor may have been the intended target, but was in an armored SUV. Samaha claims the gunman was arrested. Within hours of Ghadban’s death, the deal collapsed with multiple reports of shelling and gunfire targeting the repair teams, preventing access to the Ain al-Fijeh pumping station. Then on Sunday, the pro-Assad forces attacked on multiple axes, accompanied by shelling. 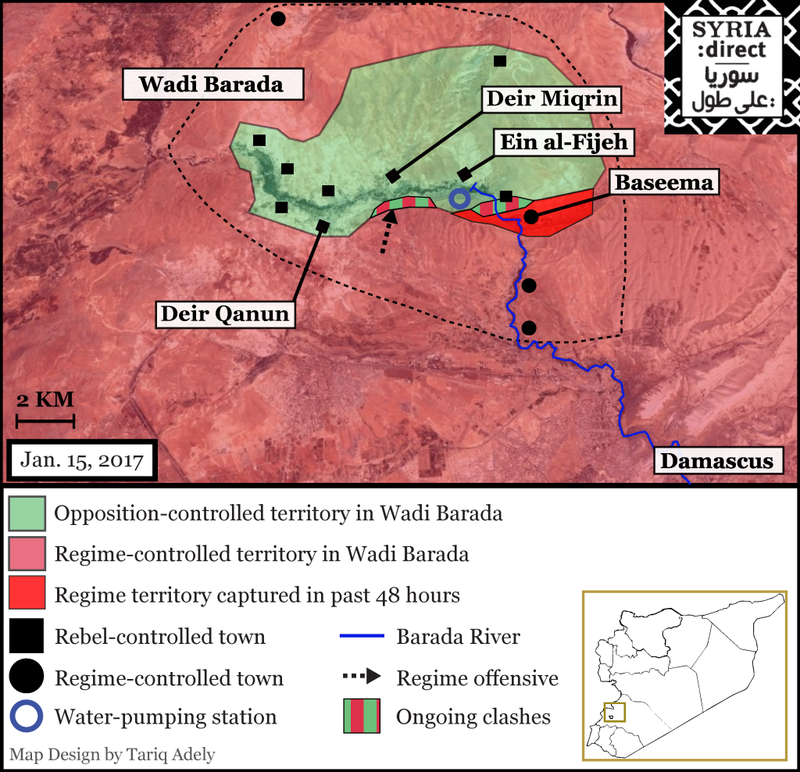 The offensive has gained some territory in the southern part of Wadi Barada. On Friday, Hezbollah finally took the village of Bassima after pro-Assad airstrikes and shelling leveled much of it. Some rebel factions have confirmed their participation in political talks with the regime in Kazakhstan next week. The factions named Mohammad Alloush, a senior official in Jaish al-Islam, as their chief negotiator. Reports indicate that other factions, such as Ahrar al-Sham, are still refusing involvement in the talks, which have been brokered by Russia and Turkey.